Although her Chictopia moniker refers to the style status of her current location, there’s no doubt that districtofchic leaves a deep fashion footprint wherever she goes. Her classic mode of dress, combined with artfully demonstrated trends, makes her one of Chictopia’s most noticeable (and most loyal; she’s been posting on here since 2008) members. 1. Q: How did you hear about Chictopia and why did you decide to join? A: I believe I started seeing it mentioned on other blogs and liked the whole democratic idea of fashion and personal style. I joined because it looked like fun. 2. 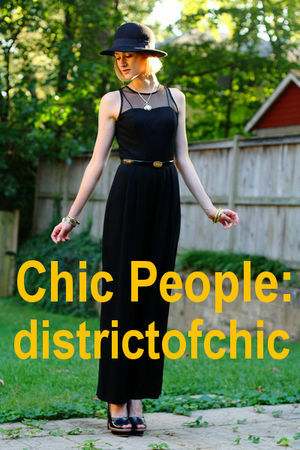 Q: What’s your favorite thing about being a member of Chictopia? A: All of the inspiration, of course! In terms of creativity and diversity, it’s far superior to any fashion mag. The models are much more interesting to look at, too. Being able to see fashion trends from all over the world is pretty incredible. If I could name two things, I would add that it’s really a very supportive community. Any criticism is constructive and I’m constantly encouraged to keep experimenting. 3. Q: How did you get interested in fashion and outfit blogging? What did you dress like as a little girl, and how has your style transitioned over the years? A: Honestly, I think I read a Radar Magazine (RIP) article called “Hack Posin’” about the whole fashion blogger scene and it was meant to be mocking, but that kind of got me hooked. It reminded me of Cindy Sherman’s work in 80s – the idea of the artist vs. model and channeling a character through photography. Anyway, I basically approached personal style blogging as an art project. It’s been a fantastic outlet for creativity. As a little girl, I wore a lot of smocked dresses with patent leather shoes. This was not by choice. My mother was big into smocking and I wish I had appreciated them more at the time, because they really were beautiful. I was more of a tomboy, though. My personal style has changed a lot over the years. I’ve gone through punk phases, preppy, you name it; and I like to think that I’ve reached a balance between these. Truth be told, though, I’m a little schizophrenic when it comes to fashion. 4. Q: What lies behind your username? How do you make your local area so chic? A: Oh it’s a little hokey now, I suppose. But at the time (and I still do this), I looked around this town and thought, “Damn! We look good!” It really bugged me to hear people say that DC lacked style, because I see an incredibly sartorially-diverse city with this wonderful mix of old school preppy, bohemian, hipster, hip hop, southern, and myriads of other influences. 5. Q: We love how your style is so classic and yet so creative! Can you tell us how you manage to make even the most wild and crazy of trends look so elegant and sophisticated? 6. Q: You wear a lot of neutral basics, accented with little pops of color. What is your favorite go-to neutral and why? A: Gray. I’ve always been a huge fan of gray, as far back as I can remember. It’s such an elegant color. There’s something very WASP-y and expensive about it. It compliments green eyes very well, which a big plus, too. 7. Q: What is the most-treasured item in your wardrobe? A: Ooo, that’s a toughie. I think if I had to pick, I would say my Givenchy cowboy boot-style, open-toed booties. They were my biggest my shoe investment to date and I’ve never regretted it for a second. A: Wow, that’s a very kind comparison. And it’s funny, because I never think of myself as a blonde, but I’ve definitely transitioned into blonde territory. I owe the cut and color all to my talented stylist, Sandra. She’s great at styling my hair so it will grow out well, because she knows I always let it go too long in between cuts. 9. Q: Where do you like to shop for clothes? A: Thrift stores and online, primarily. I love Yoox.com for fun designer shoes. I also find a lot of great things on theoutnet.com and oaknyc.com. H&M is always a favorite for staples like sweaters and blouses. For more, visit her Chictopia page or check out her personal fashion blog! Great style... a definite inspiration. Ah...she's the chicest!!! One of my all time favourite chictopians!! i cant log in without checking her page! I'll be the happiest when she becomes a style icon!!! Not because she'd been around a long time but because she has an amazing amazing amazing style-clean and sophisticated! Great interview!! great feature outfit (didn't see it yet: love that dress) and LOVE her, now reading... GREAT interview!! great interview. what a beautiful style. so classic and yet fashion-forward. shows that you don't have to be over-the-top to have great style. amazing interview! and i adore her style, so gorgeous! great interview, shes so gorgeous and classy! wonderfully written article and such a chic subject!